In 1903, a new Methodist Church was built. This building was not on the present location of FUMCFV, but on South Main Street, at a stop across the street from where Pine Street begins in Fuquay-Varina. It is still standing to this day, but is now a two story apartment building. Work began on a new church in January 1930. Money was scarce. Pastor E.C. Maness, mixed mortar and carried bricks for the building. The present sanctuary was completed and opened for services on July, 13 1930. The entire building was dedicated on November 8, 1931. On April 26, 2015 we celebrated an exciting milestone in the life of our church, the last payment on our mortgage. The end of our mortgage payment has ignited the future of this church by opening doors to possibilities and projects as we continue to be a relevant presence in this community. We have followed in the footsteps of other faithful Methodist who served God in this community since 1903. Over 100 years of serving God. Today we seek to live out God's vision for our congregation which is "to glorify Jesus Christ by feeding, healing and strengthening people in need." Our church continues to grow, both in numbers and in our faith. Our prayer is that we follow after the example of Christ both in our personal and congregational life. 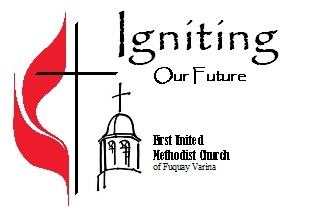 First United Methodist Church of Fuquay-Varina is a special place where the bond of Christian fellowship is ours to experience. We invite you to join us for church service and Sunday school to experience this special place for yourself!